These beautiful animals are the smallest and rarest ocean dolphins in the world, and they only live here in New Zealand. But they could soon disappear forever – unless we act now. 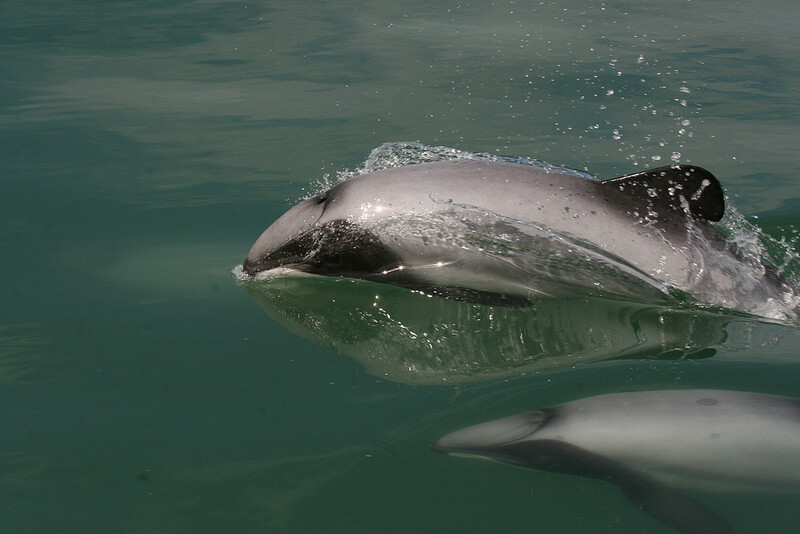 For as little as $26 million, the government can remove the biggest threats to Māui dolphins and help fishers transition to dolphin-friendly methods. We think Māui dolphins are priceless! Don't you? 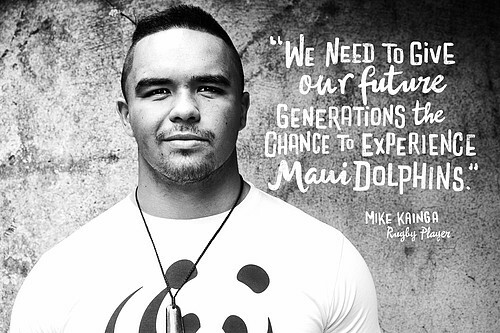 Will you call on the Prime Minister to save Māui dolphins? The science shows that fishing is the biggest threat to Māui dolphins. 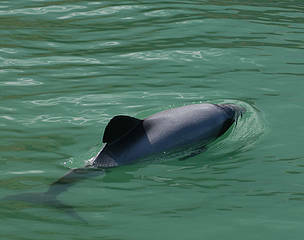 Set netting (also known as gillnetting) and conventional trawling have pushed Māui dolphins to the brink of extinction. Less than 30% of Māui dolphin habitat is currently protected from set netting, and less than 8% is protected from set netting and conventional trawling. Recent research by Business Economic Research Limited (BERL) has estimated that it would only cost $26 to $40 million dollars (which is less than three years of the ministerial travel budget) to support fishing communities to transition to dolphin-safe fishing methods. We have a chance to save Māui dolphins from the biggest threat they face, while helping people and communities who depend on fishing to preserve their way of life. But we need government to act now. WWF wants the new government to end net fishing across Māui habitat from Maunganui Bluff to Whanganui River mouth to give these little Kiwi battlers a chance to survive. Fishing with nets is the biggest threat to their survival. Scientists estimate that more than 95% of unnatural Māui deaths are caused by entanglement and drowning in set net or trawl fishing. Remember - the more you personalise your message, the more impact it will have! To have even more impact, tweet the Prime Minister and tell her that saving dolphins is priceless, or send an email! Want to have even more impact? Write your own personal letter to the Prime Minister, to Minister of Conservation, to Minister of Primary Industries, or to your local MP. That's the very best way of making your voice heard. The previous government failed to fully protect these amazing animals. They said they were worried about cost. But the numbers are clear: we can save Māui dolphins and support the people and communities that depend on fishing. BERL has looked at the impact of fishing communites of protecting Māui dolphins and has released an independent report that shows that these beautiful little dolphins could be saved for as little as $26 million (that’s less than was spent on the flag referendum, less than three years of the ministerial travel budget, and only 0.03% of the government's annual budget). So, we’re asking for the government to support fishers to move to dolphin-friendly methods of fishing, and where that's not possible, support them to move to new economic opportunities. Business Economic Research Limited (or BERL) is a leading New Zealand provider of a broad range of economic research, analysis, advice and consultancy services for all kinds of New Zealand organisations. WWF-New Zealand commissioned them to investigate how much it would cost for government to support a fair transition to dolphin-safe fishing across the whole of the Māui dolphins' range. ​BERL estimated that it would cost government $26 to $40 million to support fishing communities and people to make the switch. That's the same cost as 300-500m of the Warkworth to Wellsford expressway. 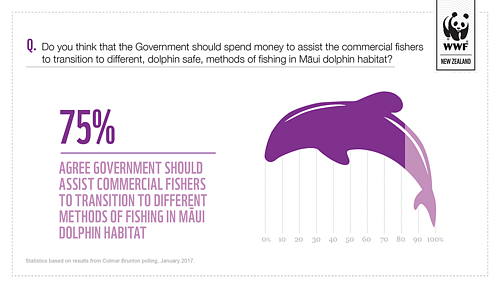 A recent poll, conducted by respected opinion research company Colmar Brunton, asked if people think the government should financially assist fishers to transition to dolphin-safe fishing methods in Māui dolphin habitat. 75% said yes, 13% said no, 12% were unsure. This confirms that the vast majority of New Zealanders want dolphin-safe fishing in Māui dolphin habitat. It shows very strong public support for the government to step in and help people and communities who depend on fishing to make the transition. Want to know more about Māui dolphins and our work to save them? Working to persuade government is just one of the things we're doing to try to save these incredible animals. $26 million is less than what the government spent on the flag referendum. It’s less than the cost of 330 metres of the Warkworth to Wellsford Motorway. It’s less than three years of Ministerial travel expenses. It’s only 0.03% of the government’s annual budget, and less than 1% of the government’s projected surplus this year.